TPS – Travel, Patents, and other sh…junk. It’s 9:35am on the east coast, but it doesn’t feel like that to me. I don’t know what time it really is, but something called “the sun” seems to be out, and it’s in the eastern sky, so therefore it must be morning. Right? Right. 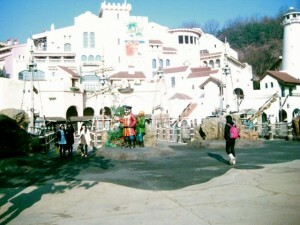 Anyway, I have a few more pictures, both from Everland from my day of travel. 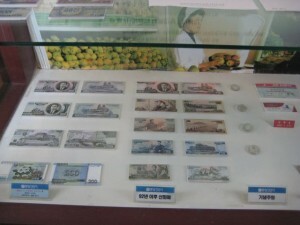 Took a few more pictures of North Korea. Closer shot of North Korea. We made it to Caribbean Bay! (Warning: Overly excited English ahead.) It was a water park, mostly indoors. I realize I said “outdoors” before, but there was an outdoor portion of the lazy river part. I had to retouch this photo since it was really really white. 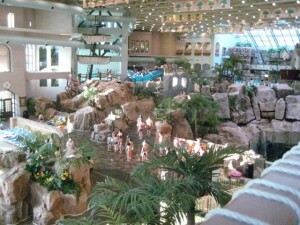 INSIDE Caribbean Bay! See the difference? There’s a water slide, a few wade pools, the lazy river, a kiddie diving pool, strictly kiddie pools, and a bunch of saunas/spas. It was a relaxing place filled with hundreds of screaming Korean kids. On the way out, I found a few gifts and took a picture of the theme park’s entrance. There was also a theme park next to Caribbean Bay. 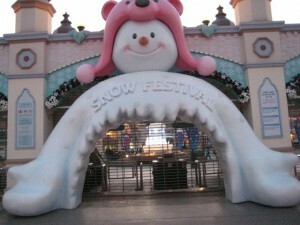 It was open for a "Snow Festival". 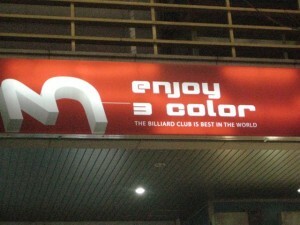 We took the bus back to Ilsan, and I found the best Billiard Club in the world. Kind of far to travel, but it’s gotta be worth it. I found the best billiard club in the world, FYI. Dinner was Kimbab, Udon noodles, and Jook. 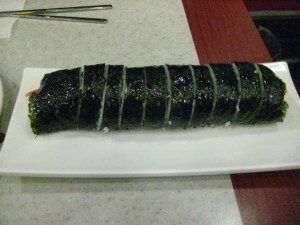 I only got a picture of the Kimbab. Kimbab! Seaweed, rice, and meat+veggies. 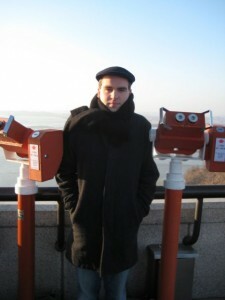 That was my last day and night in Korea. The next day was all travel. Woke up early, and headed to the airport. 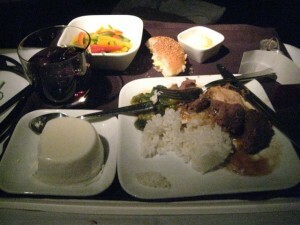 As I said, my complaint letter to Delta got me a free BusinessElite upgrade. A very nice touch for the 13 hour Incheon-Atlanta leg. Sonia holding the ticket of AWESOME. 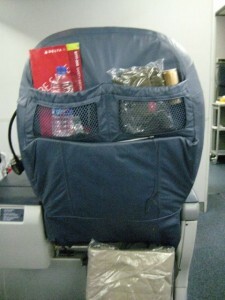 The seatback in Business Class on Delta's 777s. I sat in one of those seats. 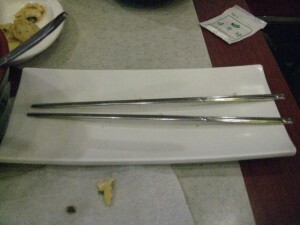 They didn’t quite lie totally flat, but reclined maybe to a 30º angle. The footrest also came up to about 75º. They also included a bottle of water, an amenity kit with all sorts of stuff, and a light that you can see on the left side for reading. 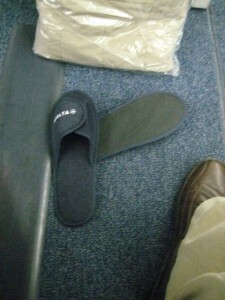 Slippers from BusinessElite on Delta. 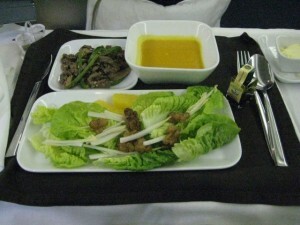 Business Class also had better food. Dinner...number 1? Pictured: Beef Japchae, Carrot and Ginger Soup, and a Fresh Seasonal Salad. The food wasn’t bad either. I missed taking a picture of the first dinner (lunch? breakfast? midnight snack? what time was it? ), but it was a “Penne Pasta in Vegetable Bolognese Sauce, tossed with arugula, fresh mozzarella, and mushrooms”. Dinner #2's main course. I chose the Tuk Galbi - "traditional korean beef in spicy soy sauce with mushrooms, pak choi, and steamed rice". 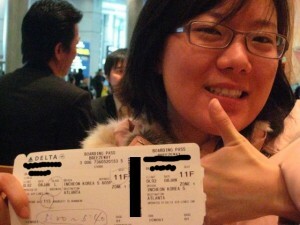 I tried to talk my way into the Delta lounge in Atlanta with my Business Class ticket, but no dice. I paid for it since I REALLY wanted a shower. The flight after was lackluster, we’ll say, in comparison. But it landed safely. That’s all I really care about. Day 2 of Korea! We spent a lot of time indoors because it was REALLY COLD. 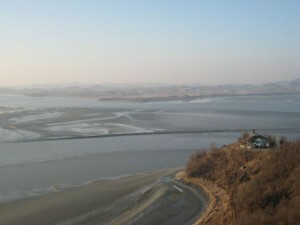 At about 2 pm, we went to 오두산 통일 전망대대, the Ohdusan Unificiation Observatory. 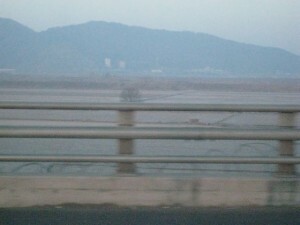 From there, one can see the border of North Korea, and also get a little idea of what life is like over there. I say “over there” loosely, because it’s about 5 km away from where you’re standing. Going from seeing the commercial part of Myeongdong yesterday, to seeing one of the most repressive and insular nations in the world, is a bit of a shock – you barely realize that they’re literally next to one another. There’s something a bit voyeuristic about looking into another country that you can’t physically visit. North Korea - maybe 4 km away from it. 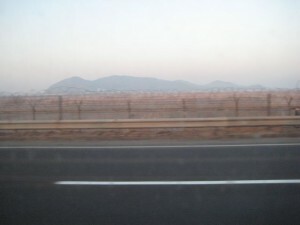 North Korea in the background. It's VERY COLD THERE. 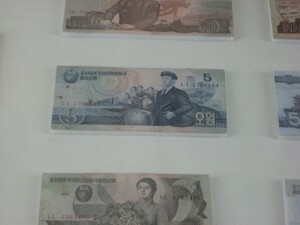 5 North Korean won = 3.5 US cents. Anyway, after that, we went back to her house and headed out for dinner. 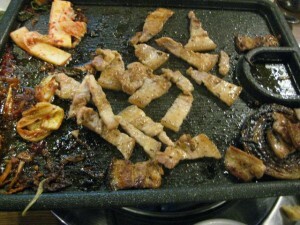 We had 삼겹살 (literally, “three layer pig”). I know that layers one and two were meat and fat, but I’m not 100% sure what layer 3 was. It looked like more fat, heh. A short day in terms of things done. But it’s a vacation, not a job My pictures are also on Facebook, so check them out there!